Western Whiskey Gazette (WWG): It's Miller Time! "The Champagne of Bottled Beers." "If you’ve got the time, we’ve got the beer. Miller Beer." Ok, we all like a good slogan. But in this case, we're not talkin' beer. We're talkin' bourbon. E. Martin & Co. They were a thorn in A. P. Hotaling's side, and a cash cow for Hotaling's attorneys, from around 1872 until the Supreme Court ruling against Martin for copyright infringement in 1879. During those seven short years, Edward Johnson Martin along with partners Daniel V. B. Henarie, E. P. Rowe and James Mairs did their best to steal away the J. H. Cutter brand from Moorman, and subsequently Hotaling. Three different fifths, and one flask (both 1/2 pint and pint in capacity) were made for E. Martin & Co.
One of Martins fifth molds was an exact clone to Hotalings early container; the "shoulder Crown". It is the earliest, dating ca. 1872. Another, is the mid crown, which was made slightly later, probably in response to growing pressure from the Hotaling camp about copyright infringement. Thinking that repositioning the crown from the shoulder, to the center of the embossing pattern, would get the Hotaling camp off their back, the mold was thus redesigned. It obviously didn't work and Hotaling, like a dog with a bone, refused to give up. Regardless, they must have sold a lot of product as both the shoulder and mid crown Martins are present in many west coast collections. It took several years, but A. P Hotaling emerged victorious and E. Martin & Co's attempt to steal away the J. H. Cutter brand was thwarted. Once the courtroom dust had settled, they simply changed the initials from J. H. to J. F., redesigned the molds and went on their merry way until prohibition put both them and Hotaling out of business in 1919. One bottle that didn't have such a popular following, was the Millers Extra brand. My guess is that like Hotaling's OPS, Millers Extra was their top shelf bourbon and, as such, was out of the financial reach of the working class. Good thing for us, because there's not many to be had, and when one does appear for sale, it's quickly snatched up. 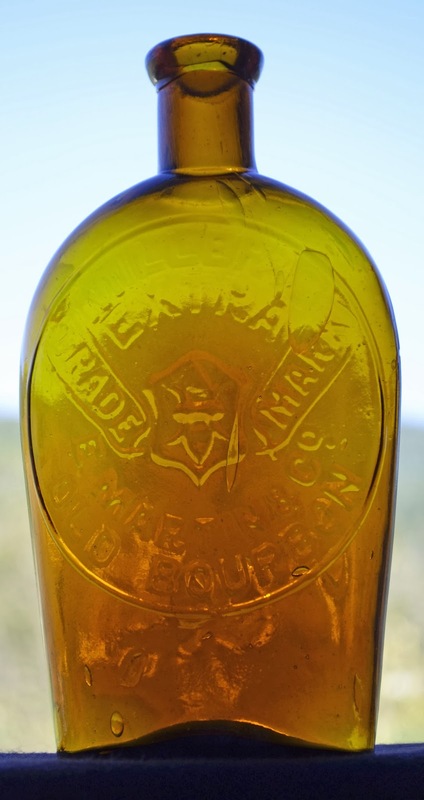 As mentioned, the bourbon was bottled in an applied top fifth, and two different sizes of flasks; both also with applied tops. 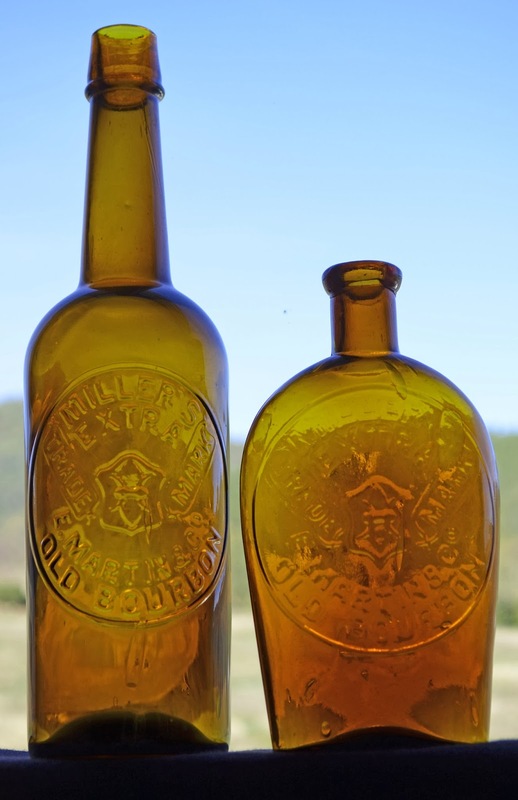 These are early bottles, dating from ca. 1872 until the mid seventies, and generally have everything going for them in terms of crudity and appeal, common to this era of S.F. glass. It was obvious that E. Martin & CO. was going after brand recognition in a big way too, since the embossing pattern on both the flasks, and the fifth are identical. This is something of an anomaly as the embossing on most western flasks of this era are different than the fifths. Brand recognition or not, the numbers just weren't there. According to Thomas, there were only 10 mint fifths in collections as of 2002. For whatever reason, the flasks do seem to exist in greater numbers than the fifths. Again an anomaly as most rare western brand flasks are greatly outnumbered by their fifth counterparts. The 1/2 pint Millers are supposedly rarer than the pints. I personally haven't seen enough of either over the years to form an opinion. Color, character and crudity are the big three "C's" when it comes to 70's western glass. Fortunately for us, the Millers fill the bill in all three departments. Although most of the Millers are seen in the "typical" medium amber hues, a few anomalies exist. Occasionally both the fifths and the flasks are encountered in shades of extremely light amber, shading to near yellow, and on rare occasions, straying toward green. And talk about crudity! Sloppy is often the rule of the day. Spillover, slumped in sides, bubbles, tears, swirls and massive swings in color density are occasionally encountered. Face it; no matter what shape or size, ya just gotta love those Millers! I've always loved the Miller's bottles and it's always fun to talk about them and see photos. I'm assuming the 1/2 pt flasks you are referring to made by E. Martin, are the base-only embossed E.M.Co flasks. If someone out there has a 1/2 pt Millers.... pls do post a pic of it !! That would rock the western whiskey world !! Martin was also responsible the JF star/shield, and of course, the Millers. His earliest Fifth, that is the REAL clone of the Hotaling JH...... is the E Martin shoulder ctrown that has no embossing on the reverse shoulder. The bottle is also a larger capacity, equivolent to the Hotaling crown-shldr. and is extremely rare and difficult to find in mint condition. Those blown with embossed circle on the reverse are a narrower bottle and a completely different mold, and are quite easily obtainable, although go out and try and dig one now .... no easy task ! I disagree on the assertion that after losing the court battle with Hotaling, E. Martin then changed the JH to JF on his molds. I have never seen any Cutter bottles with a crown and the letters "JF" on the same bottle. I don't think he changed any of his molds, other than ordering new JF star/shield molds,since the JF brand was so successful, which by the way, he'd already done at least once prior to the court battle,. He went thru at least 3 JF star/shield molds from 1870 to the early 80's. The big question is: where are the JF bottles from the 1890's ?? What did he use ? Paper label only ?? Any theories from blog readers out there ?? Martin ceased using the Crown motiff and the JH initials after losing the court battle. He most likely then doubled his efforts on JF, and was successful with that all the way up into the 1900's. As a side note: my theory on the Miller's 1/5's is that they are slightly later than the flasks. From dig surveys and personal interviews, they seem to be dug in early 1880's pits and also have been found at mining town sites that were at their zeniths in the early 80's. The exception to this though, is the fifths that have been found at Cerro Gordo. It's possible that Martin, after ceasing to use the JH shldr crowns and midcrowns, decided then to bring a new fifth into play..... the Millers. This could account for their rarity, as they may've come a little too late after the popularity of the brand waned. This is just my theory on the Miller's fifths. I have a Cerro Gordo fifth. It is really lovely!